Iacobus Arthurus Gosling, OC (natus James Arthur Gosling, 19 Maii 1955 prope Calgariam Albertae) est scientista computatralis Canadiensis, notissimus Java linguae programmandi pater et pro Unix contributus est. Anno 1977, ei concessus est gradus Baccalaureatus Scientiae in scientia computatrali ab Universitate Calgariana. Anno 1983, ei concessus est gradus PhD in scientia computatrali ab Universitate Carnegie Mellon, a Roberto Sproull inspectus. Iacobo Gosling sunt uxor et tres filiae: Kate, Lorena, et Kelsey. Arnold, Ken, et James Gosling. 1996. The Java programming language. Addison-Wesley. ISBN 0-201-63455-4. Arnold, Ken, et James Gosling. 1997. The Java programming language. Ed. 2a. Addison-Wesley, 1997, ISBN 0-201-31006-6. Arnold, Ken, James Gosling, et David Holmes. 2000. The Java Programming Language. WEd. 3a. Addison-Wesley Professional. ISBN 0-201-70433-1. Arnold, Ken, James Gosling, David Holmes.2005. The Java Programming Language. Ed. 4a. Addison-Wesley Professional. ISBN 0-321-34980-6. 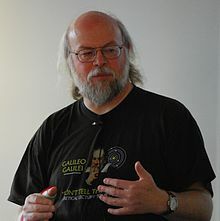 Bollella, Gregory, Benjamin Brosgol, James Gosling, Peter Dibble, Steve Furr, David Hardin, et Mark Turnbull, eds. 2000. The Real-Time Specification for Java. Addison Wesley Longman. ISBN 0-201-70323-8. Gosling, James, Bill Joy, et Guy L. Steele Jr. 1996. The Java Language Specification. Addison Wesley Publishing Company. ISBN 0-201-63451-1. Gosling, James, Bill Joy, Guy L. Steele Jr., et Gilad Bracha. 2000. The Java Language Specification. Ed.2a. Addison-Wesley. ISBN 0-201-31008-2. Gosling, James, Bill Joy, Guy L. Steele Jr., et Gilad Bracha. 2005. The Java Language Specification. Ed. 3a. Addison-Wesley Professional. ISBN 0-321-24678-0. Gosling, James, et Henry McGilton. 1996. The Java language Environment: A white paper. Sun Microsystems. Gosling, James, David S. H. Rosenthal, et Michelle J. Arden. 1989. The NeWS Book: An Introduction to the Network/Extensible Window System (Sun Technical Reference Library). Springer. ISBN 0-387-96915-2. Gosling, James, Frank Yellin, et The Java Team. 1996. Core Packages. The Java Application Programming Interface, 1. Addison-Wesley. ISBN 0-201-63453-8. Gosling, James, Frank Yellin, et The Java Team. 1996. Window Toolkit and Applets. The Java Application Programming Interface, 2. Addison-Wesley. ISBN 0-201-63459-7. Vicimedia Communia plura habent quae ad Iacobum Gosling spectant. Novissima mutatio die 19 Maii 2018 hora 22:43 facta.